The rumors are flying again about the 3.8% Medicare tax in the health care reform law. The messages say the tax is imposed on unearned income that includes the sale of a principle residence. But what you need to know is that the tax is actually far narrower and the $250,000-$500,000 capital gains exclusion for primary residences remains in place. Understand that this tax WILL NOT be imposed on ALL real estate transactions, a common misconception. Rather, when the legislation becomes effective in 2013, it may impose a 3.8% tax on some (but not all) income from interest, dividends, rents (less expenses) and capital gains (less capital losses). And the tax will fall only on individuals with an adjusted gross income (AGI) above $200,000 and couples filing a joint return with more than $250,000 AGI. I like to make sure that I’m keeping up with as much industry news as possible (although, let’s be honest, the news can be confusing, conflicting and contradictory leaving me feeling bogged down and overwhelmed!). On most days, I read two or three newspapers, several online real estate news wires and review all of the “leading economic indicators.” Combine that with my subscriptions to housing statistical reports in 3 markets and you’d think that I would have answers to just about any question thrown in my direction. The Daytona 500, NASCAR’s biggest race of the year, kicks off the NASCAR season this month. As the race-car drivers take “the turn”, the driver’s focus is to hit it just right in order to accelerate into the straight-away. That way, the driver can either stay in the lead or take the lead using the advantage of the turn. In many ways, it feels like we are in “the turn” right now in the Triad too. Whether we are talking about consumer confidence, the state of the economy, or the real estate market in general, we are in “the turn” getting ready to accelerate to hit that straight-away. What Did You Say? Now Is the Time to Buy? What did you say? Now is the time to buy real estate? When companies look to relocate to Charlotte, one of the first questions asked is, “What is there to do in Charlotte, particularly for sports fans?” To make sure I’m giving the best answer possible, I frequently look to Tom Apke, a long time college basketball coach and sports broadcaster who now works in our Relocation Department. Tom always begins by telling me that the professional sports are the obvious starting point. 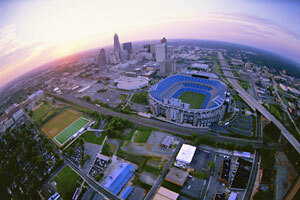 The Carolina Panthers NFL team plays at Bank of America stadium in uptown Charlotte and the NBA’s Charlotte Bobcats also play in uptown Charlotte at the Time Warner Cable Arena. A fun fact we always like to tell people is that the Bobcats majority owner is Michael Jordan. By now I’m sure you’ve heard that Facebook got another Facelift. That’s right, another Facelift. As if all the previous pulling, sculpting, modifying and updating wasn’t enough…they’ve revamped themselves yet again. If you were to line up Facebook next to Joan Rivers, I’m pretty sure Facebook would come out on top for having had more work done. While some of Facebook’s updates have gone undetected this one is sure to turn more than just a few heads. On February 10, Facebook released one of the most anticipated updates for those who own, modify and manage a Facebook Page. As is the case with most, these new “upgrades” will certainly be put under the magnifying glass. We’ll scrutinize, analyze and perhaps criticize but, in my humble opinion, I think that these updates are a step in the right direction given how many businesses, brands and companies are using Facebook to communicate with their customers. Since February 8th, when many people began to get their “Notice of Real Property Assessed Value”, our phones have been ringing off the hook with questions. Therefore, I wanted to address your concerns in this blog post. First, please note that this is not your new property tax bill. This is a revaluation of your home by Mecklenburg County. Remember that the assessor is trying to place a fair market value on your home. This assessment is not setting your tax rate or tax bill. The job of setting the tax rate belongs to the Board of County Commissioners. The BOCC will determine our property tax rate during the county budget process sometime in June. Your first new tax bill will be sent this September and will be based on the new assessed value AND the new tax rate. Therefore, we will not know how this reassessment affects our tax bill until the tax rate is set in June. Did you know Allen Tate Insurance strives to be the best option for your insurance needs? And did you know that Allen Tate Insurance really got a makeover? New Website. New Look. Same Service. Same Results. Clarity was our goal while designing a new website that is both intuitive and easy to navigate. The website strengthens our relationship and brings us closer to our family of insured’s in our effort to constantly provide the best service possible. Have you ever considered replacing your flooring but had a hard time deciding what covering to use? Or have you ever tried to decide between two homes that you liked but weren’t sure if you liked hardwoods in one vs. carpet in the other? I never really considered flooring until a few years ago when I moved from my home which had predominately hardwood to my new home which was 50% hardwoods and 50% carpets. I never knew what impact the flooring in the new home would be on my family’s allergies! All of the sudden, my family had contracted allergies. Most notably, I saw a huge change in my son. He seemed to always have a cold or a sinus infection and I had to take him to the doctor several times during those first months. I could not for the life of me figure out what had changed until discussing it with his pediatrician. He was the one that pointed out the difference flooring can make and the correlation to our illnesses and allergies.